Senior Kunal Patel focuses on his next move during a chess practice. 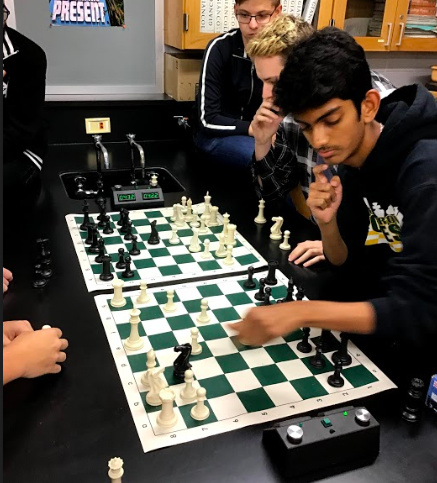 Senior chess player Kunal Patel recalled the time after his freshman season when the Elk Grove High School chess team’s core group seniors on the team had graduated. That left the Grenadiers with a new batch of inexperienced players. And then by Patel’s sophomore year, two more seniors had gradated. But over the course of those years, that same squad of once-inexperienced chess players blossomed into upperclassmen leaders. That’s the common theme of this Elk Grove High School chess team: Growth. Despite losing those seniors that held the team together, the Grenadiers have managed to maintain a positive mindset and pull out some victories this year. One of those came Nov. 1 when the EGHS chess team beat John Hersey High School 44-24. Wins from Patel, Brian Rosca, and John Kaczowka helped propel the Grenadiers over the Huskies. With the team’s success against Hersey, EGHS chess sponsor Peter Wang credits the team’s leadership to Patel and Tomoko Sakurayama, who hold the highest ranks among the team. In addition to Patel and Sakurayama, Max Martinez is another asset to the team. As a junior chess player, he has been a member of the chess club since freshman year. Martinez in return credits Wang for teaching players to analyze strategies and see potential moves the players don’t otherwise see. Martinez also noted how the team has managed to grow over the past few years despite losing a core group of seniors. The team always goes over the games they play and think about what they could have done, then apply their knowledge to similar situations in the future.